I was struggling with a recent test using frida, knowing it could do what I want but unsure how. After lots of googling and trial and error I eventually got it working. So I decided I would make a playground to hone my frida skills. It turned out not entirely terrible, so here it is for anyone to play with. The code is unobfuscated so feel free to reverse and read that. Changing a hardcoded variable, Modifying the return value from a function, Running a function unused elsewhere, modifying arguments sent to functions, manipulating variables live, bruteforcing a PIN and finally modifying data on the screen. If you solve any of these I’d be interested to see how you did, if you did in a different or unique way, feel free to share you code here or visit the “contact me” page. 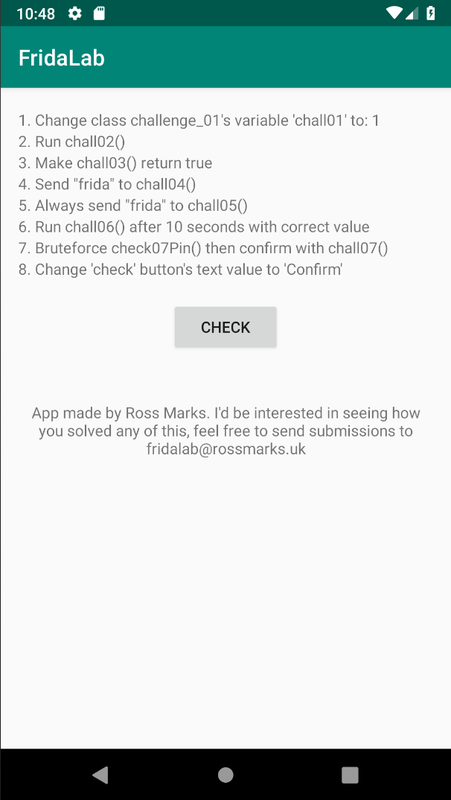 This entry was posted in Android by Ross Marks. Bookmark the permalink.